Here is a peek at Rock Island’s own homegrown amusement park. Like Chicago’s Riverview, New York’s Coney Island, and the much later Disneyland, the Watch Tower amusement park was a destination for people from near and far in the early 1900s. It was located in an area that we now respect as one of our most peaceful and historic places, Black Hawk State Historic Site. But as this postcard shows, at the turn of the century this was a happening place. In 1882, Bailey Davenport extended his street railway line all the way out 11th Street to a station at the junction of 9th and 11th Streets. Only a few folks, certainly not enough to support the new rail line, lived out there in the small town known as Sears. But Bailey ensured heavy use of his street railway by creating a park on the Rock River bluff known as Black Hawk’s Watch Tower. Moreover, he provided a link from the 11th Street station to the park entrance. In its early years, Bailey’s park emphasized quiet recreation – walking, picnicking, and partaking of the reputedly health-giving spring water that flowed from the bluff. When the several local street railway systems were consolidated under a single ownership in 1891, the park was included in the sale, setting the stage for the “modern” amusement park that operated at Watch Tower for over thirty years. The concept of the amusement park dates was popularized in 1893, when the Columbian Exposition introduced the Ferris Wheel to the world along with other recreational diversions that lined Midway Plaisance in Chicago. The world liked what it saw at this World’s Fair and soon entertaining amusement parks sprang up across the country. To help understand this postcard, spend some time taking a tour through the Watch Tower amusement park as it looked in the early 1900s. Start at the old inn located right where the current inn stands. There were three different inns built during the amusement park years, all in the same location. The first two inns burned; the last one was demolished. These inns were designed to accommodate dining, dancing and other entertainments. Directly downhill from the inn to the north was the street railway station. To the northeast of the inn, approximately where a parking lot is now, was the Figure 8 roller coaster with its covered entrance area that is shown on this postcard. This was a four-loop rollercoaster shaped as its name implies. A small bandshell stood a short distance from the southwest corner of the inn. Farther west was an elegant two-story dance pavilion. Just beyond the pavilion, the wooden track for the Shoot the Chutes started at the top of the bluff and followed an easterly diagonal path down to the Rock River. Close to the road and north of the Chutes was an open skating rink and a penny arcade. Farther west of them was a merry-go-round and a (presumably water) ride called the Old Mill. Scattered throughout the grounds were various booths, offering everything from photographers and bowling alleys to fortune-tellers and shooting galleries. One booth was called “Aunt Sally;” perhaps she was the fortune teller. A water tower, ice house and outdoor toilets provided other amenities for patrons. 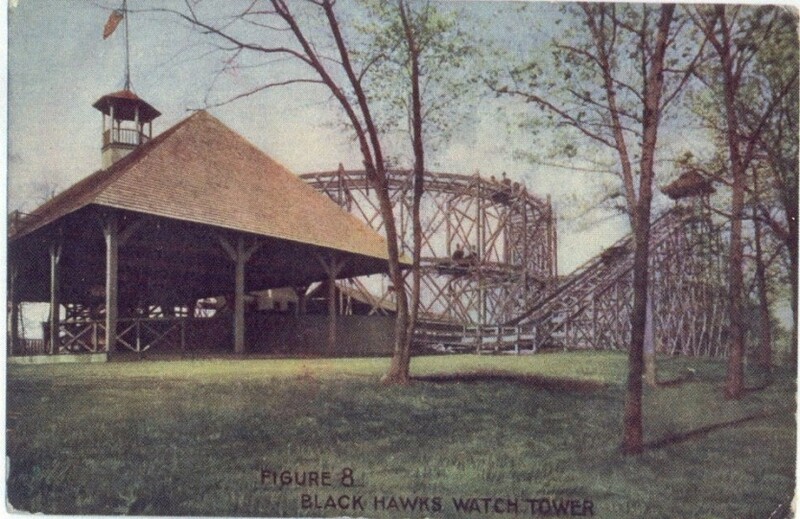 The amusement park continued to operate until 1927, when the State of Illinois acquired the land for a state park. By this time, the nearby town of Sears had been incorporated into the larger Rock Island. Although the town name only appears on land title histories, many historical Sears buildings still exist. This article by Diane Oestreich is slightly modified from the original, which appeared in the Rock Island Argus and Moline Dispatch on August 18, 2002.